Polysomnography is a series of tests performed on patients while they sleep. Polysomnography is a comprehensive overnight procedure that evaluates sleep disorders . It generally includes monitoring of the patient's airflow through the nose and mouth, blood pressure, heartbeat as measured by an electrocardiograph, blood oxygen level, brain wave patterns, eye movements, and the movements of respiratory muscles and limbs. The word polysomnography is derived from the Greek root poly meaning "many," the Latin noun somnus meaning "sleep," and the Greek verb graphein meaning "to write." Polysomnography is used to help diagnose and evaluate a number of sleep disorders. For instance, it can help diagnose sleep apnea, a common disorder in middle-aged and elderly obese men, in which the muscles of the soft palate in the back of the throat relax and close off the airway during sleep. Sleep apnea may cause the person to snore loudly and gasp for air at night. It may also cause the person to be excessively drowsy and likely to fall asleep during the day. Another syndrome often uncovered by polysomnography is narcolepsy . Persons with narcolepsy have sudden attacks of sleep and/or cataplexy (temporary loss of muscle tone caused by moments of emotion, such as fear, anger, or surprise, which causes people to slump or fall over), sleep paralysis or hallucinations while they are falling asleep. Polysomnography is often used to evaluate such parasomnias (abnormal behaviors or movements during sleep) as sleepwalking; talking in one's sleep; night-mares; and bed-wetting ( enuresis ). It can also be used to detect or evaluate seizures that occur in the middle of the night, when the patient and his or her family are unlikely to be aware of them. Other problems uncovered by polysomnography include sleep-related psychiatric depression, asthma, and panic disorder . Polysomnography is generally not used if the sleep disorder has been clearly identified by the treating physician. It is also not used in cases of insomnia that have simple and obvious causes. Polysomnography is extremely safe, and no special precautions need to be taken. Polysomnography requires an overnight stay in a sleep laboratory. While the patient sleeps, he or she is monitored in a number of ways that can provide useful information. A polysomnograph collects data on the electrical activity of the heart and brain, and muscle activity in the face and neck of a sleeping subject. 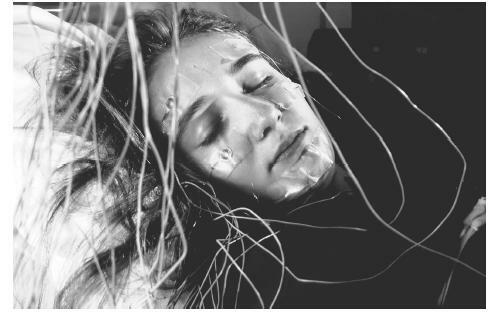 One form of monitoring is electroencephalography (EEG), which involves the attachment of electrodes to the patient's scalp to record his or her brain wave activity. The electroencephalograph records brain wave activity from different parts of the brain and charts them on a graph. The EEG not only helps doctors establish what stage of sleep the patient is in, but may also detect seizures. Another form of monitoring is continuous electrooculography (EOG), which records eye movements. EOG is used to determine the time periods during which the patient is going through a stage of sleep called rapid-eye-movement (REM) sleep. Both EEG and EOG can be helpful in determining sleep latency (the time period between getting into bed and the onset of sleep); total sleep time; the time spent in each sleep stage; and the number of arousals from sleep. The airflow through the patient's nose and mouth are measured by heat-sensitive devices called thermistors. The thermistors can help detect episodes of apnea (stopped breathing), or hypopnea (inadequate or too-shallow breathing). Another test called pulse oximetry measures the amount of oxygen in the patient's blood. Pulse oximetry can be used to assess the degree of oxygen starvation during episodes of hypopnea or apnea. The electrical activity of the patient's heart is also measured on an electrocardiogram, or EKG. Electrodes are attached to the patient's chest. The electrodes pick up electrical activity from various areas of the heart. They help to detect cardiac arrythmias (abnormal heart rhythms), which may occur during periods of sleep apnea. The patient's blood pressure is also measured, because some episodes of sleep apnea can raise blood pressure to dangerously high levels. In some cases, sleep laboratories monitor the movement of the patient's arms and legs during sleep. This measurement can be helpful in detecting such sleep disorders as periodic limb movements. Some sleep laboratories perform an additional test called multiple sleep latency testing (MSLT), which records several naps throughout the day. In addition, many sleep researchers prefer to evaluate the patient over a period of a few days rather than just one night. This approach is based on the recognition that the patient may need more than one night to adjust to the unfamiliar surroundings of the sleep laboratory. The patient may be asked to discontinue taking any medications, and avoid alcohol and strenuous exercise the day before the sleep analysis is performed. Before the patient goes to sleep, the technician hooks him or her up to all of the monitors being used. After the test is completed, the monitors are detached from the patient. No special measures need to be taken after polysomnography. On occasion, skin irritation from the adhesive can develop in the areas where the electrodes have been attached to the patient. A normal result in polysomnography shows normal results for all parameters (EEG, EKG, blood pressure, eye movement, air flow, pulse oximetry, etc.) that were monitored throughout all stages of sleep. Polysomnography may yield a number of abnormal results, indicating one or more potential sleep disorders. For instance, abnormal transitions into and out of various stages of sleep, as documented by the EEG and the EOG, may be signs of narcolepsy. Reduced air flow through the nose and mouth, along with a fall in blood oxygen levels, may indicate apnea or hypopnea. If apnea is accompanied by abnormal patterns on the EKG or elevations in blood pressure, then the sleep apnea may be producing harmful effects. Frequent movements of the patient's arms and legs may suggest a sleep disorder called periodic limb movement. A related condition that affects sleep as well as daytime movement is called restless legs syndrome. Polysomnography can also be used to diagnose bruxism, which is the chronic grinding of the teeth during sleep. Czeisler, C. A. and others, eds. Harrison's Principles of Internal Medicine. 15th Ed. New York: McGraw-Hill, 2001. "Practice parameters for the indications for polysomnography and related procedures." Sleep 1997 (Reviewed 2000); 20: 406-22. National Heart, Lung and Blood Institute. P.O. Box 30105, Bethesda, MD 20824-0105. (301) 251-1222. <http://www.nhlbi.nih.gov> .